Can we breathe in space? Very interesting. Question that you may never thought of finding out more. Windows 8, my personal review. Just one more week, Microsoft will release the latest OS to the consumers. There are many who loves it as well as hate it. Windows 8 has already been a long ride since the first announcement many months back. It supposed to be the biggest changed since Windows XP. The OS main objective is to change the entire UI to be optimise for touch screen and improve the battery life and many features. The OS currently only available for the MSDN subscribers and has not officially release to the public. I always has been curious about new technologies and decided that I should try it also since I am also the subscriber. I have been using it daily since August and I should write down what I think of it. So far I have done twice installation one to test on Windows-To-Go (Full featured Win8 boot up using thumbdrive or portable HDD) and the other on my desktop. Many people has complained about this issue over and over again. I do not see why people just cannot accept some changes. We know we have been using start button since Win XP but come on, a change might be better instead. Initially well for me I was not really used to it but if you can empowered the feature to brings, it actually brings more productivity to your work. Just think of the UI screen is actually the big start menu. Press windows key to go straight to desktop. Type any software name to bring straight up to the closest search. Ctrl-Q to search through the app. Its that simple! More importantly it works. Why do you have to move your mouse all the way to the button and click just to bring up the apps? These are just one step lesser compare to windows 7. This is the part which split between the 2 OS. Windows 8 and Windows 8 RT. One runs on application compiled in x86 the other in ARM. The main different to me to put it layman term is the speed and battery life and size. Apps compiled and run in x86 are generally faster which the processor is faster (able to do more complex in 3D), use up more battery and feels more warmer. Overall size are also generally bigger than ARM. The only best benefits is that it runs on all your applications which you can previously run on your laptop or desktop. ARM which I do not need to explain as it is completely opposite which I mention earlier. I believe if you run any native app the whole day compare to Windows 8 App, there will be significant difference in battery saving. 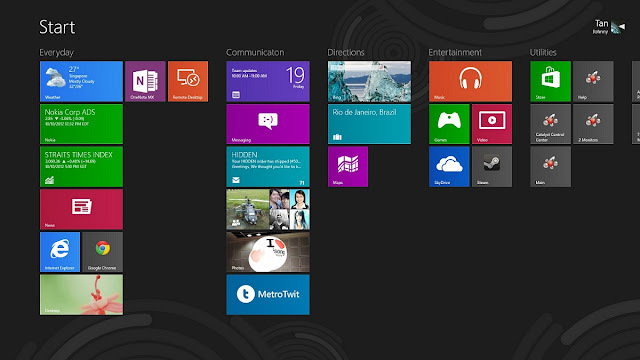 Windows 8 comes with multitask feature where you can run 2 apps side by side. If you have a Windows 8 App and if you try to switch to other apps, the active app will be tomb-stoned. (application comes to a pause and will not be ran on the background) I am not very sure if its able to run on background as I have not read up on developing the app yet. If you have notice that on the screen it does not have a start menu then where is the shutdown button? It took me quite a while to know that it was hidden in the charm settings. Well to be frank initially it makes me a frustrated user but hey come on! By the time if you have read this, the solution is already on the net or maybe in the updated tutorial. Obtaining the copy now means that I am an advance user and Microsoft is kind enough to let us access early to play around with it and gives feedback to them. Anyway it is still unofficial release. Unfortunately for some people who are ranting on it, either somehow they got a bootleg copy or they have no idea what is their role played in this RTM version. Oh ya btw, to shutdown the computer, you simply just press the power button on your machine. That it! That simple! Shutdown took me around 3sec to complete which was vast improvement over windows 7. So far what other things I have encountered that feels broken? Zune software might not be continue for windows 8 which is a waste as I feel that it is even more configurable than iTune in terms of storage and how you want to organise. I hope the new music organizer will work similar though Microsoft is still keeping mum about it. Valve's Steam browser does not work properly for videos that use flash player. Hopefully Valve can do an update to this by using html5 video instead. Is Windows 8 really for me? Was it worth the upgrade? Yes for me and if you are a fan of touch screen I suggest you try for it. Its really intuitive even though I am using keyboard and mouse. Give yourself a month and see for yourself. No one can ride a bicycle if one has never try it.